Emotional and mindless eating are normal - we all do it! During the holidays, however, emotional and mindless eating can become magnified and all of the food-oriented social occasions and celebrations can be a source of anxiety too. Not only is food everywhere, but you may feel more stressed, lonely, exhausted, overwhelmed, or even happier-all common triggers for emotional eating and for overeating. So as to support you through what can be a challenging time, I am inviting you to treat yourself with a very special gift - one that will help you to face the holidays and enjoy eating the food you love, without deprivation or guilt. And ultimately, one that will set you on your way to healing your relationship with food and your body, for good. This 8-week program will help you to stop obsessing about food, eating, and weight and provide you with the awareness, tools and strategies to make the best decisions for yourself. Join Joanne and others on a journey of self-discovery, self-compassion and self-care. Using the Am I Hungry? curriculum from Dr. Michelle May, this course guides you through you a simple, sustainable process for changing the way you think about and relate to food. What's holding you back from taking charge this Christmas? This course meets online once a week to build self awareness, experiment with new strategies, share struggles and successes with one another, and change together. No need to drive to an appointment, just call in and connect! For only £99* and 2 months, you can make a change to impact the rest of your life. *This is a very special flash sale price. Only for this seasonal webinar promotion. The Am I Hungry? curriculum lets you take charge of your relationship with food, and helps you understand how to approach food in a life-enhancing wellness-centered way. Watch this 3-minute overview now. 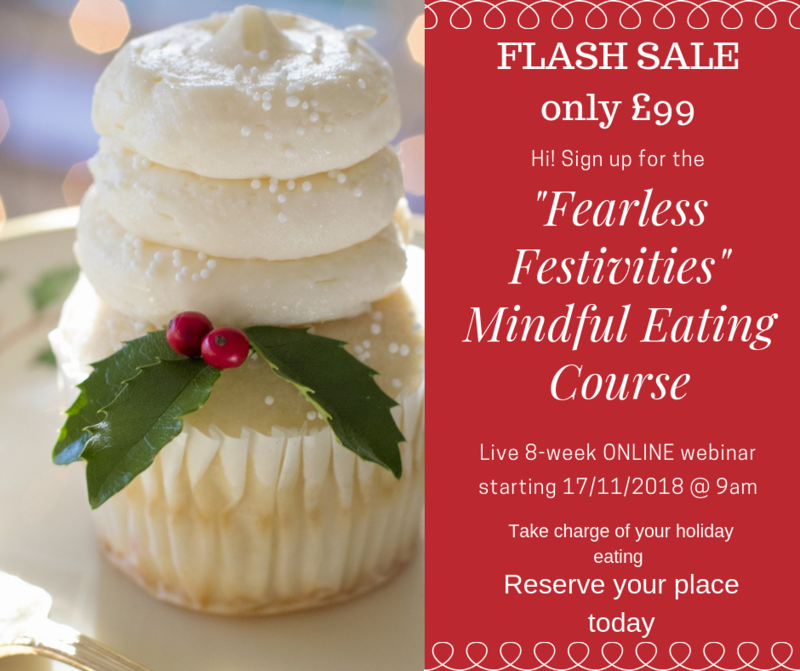 ​On completion of the course you will be eligible to join an Online Support Community and/or sign up for private 1-1 coaching sessions as you continue your mindful eating journey. ​and visit the Emotional Eating page on this website.